Planning to go camping with kids can either bring excitement …or complete dread! Let’s face it, camping with kids is not always a walk in the park! And my four boys are always asking if we can go camping. “Can we go camping?” Those words often come with excitement from the kids but may leave you feeling overwhelmed and hesitant because there is always SO MUCH TO DO to make a camping trip happen. I’ve been in that position so many times over the years. I want to make those fun memories with my boys, but at the same time it is hard to organize and manage a camping trip with kids. Let’s be honest. A lot of the time camping with kids is not a whole lot of fun for mom. There is so much to remember to pack, meals to be prepared for, ways to keep the kids entertained at night or during bad weather, and so many other things you have to organize. It’s exhausting just thinking about it! Over the years I have found that organization is the KEY to planning and actually enjoying camping with your kids. 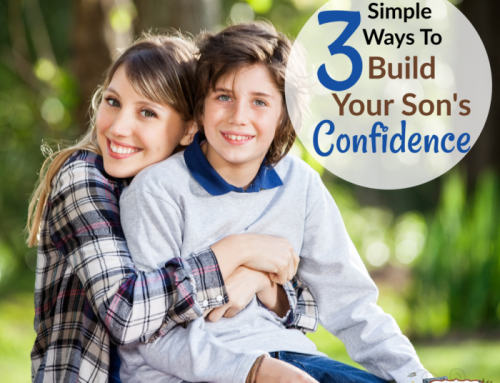 Here are some tips that have helped me to look forward to camping with my kids. Have a Camping Checklist – Packing everything you need for camping can be a nightmare and SO overwhelming! There is so much you need to pack including food, ways to cook food, clothes, sunscreen, repellent, tents, sleeping bags, and the list goes on and on and on. Trying to pack everything without a list is just too hard. I use the same list each time we go camping and now I never worry about forgetting something important. Have a Plan – Where are you planning to go camping? What is there to do in the area? Do you need a permit? Any licenses such as a fishing license? Where is the nearest hospital in case of emergencies? If you have problems, do you know who to call? These are just a few things to think about when making a camping plan. Camping with kids can be SO unpredictable. Having a plan, helps keep everything organized and minimizes surprises. Plan for Bad Weather and Boredom – In a perfect camping scenario, the weather would be beautiful and the kids would entertain themselves for hours each day just by running around in the great outdoors. But let’s be honest…that rarely happens! Plan for bad weather or boredom by having some camping games and activities on hand. Camping Charades is one of our favorite camping games! Have a Meal Plan – Don’t wait until meal time to figure out what you are going to make. Have a plan for each meal set ahead of time. That way you will know just how much time your food will take and kids won’t be sitting around hungry while they wait for their food. Hungry kids = Grumpy kids! We love this 3-day meal plan that is included in the Camping Made Easy printable set. My boys love all of these recipes! Prepare some nighttime fun! – The best part of camping to me is sitting out at night around the campfire and singing campfire songs, telling stories and looking at the stars. And for kids, night games are the BEST THING EVER!! Teach them some of the classics like Kick the Can and No Bears are Out Tonight! What is your best tip for making camping with kids easy and fun? 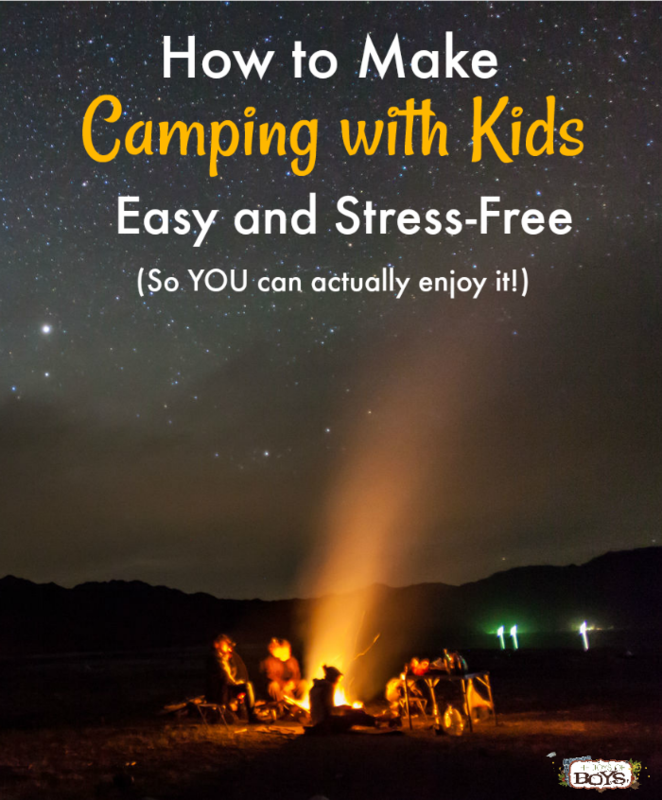 I’ve been on plenty of campouts with my boys over the years and put together a resource that will help to take the stress out of your next camping experience. 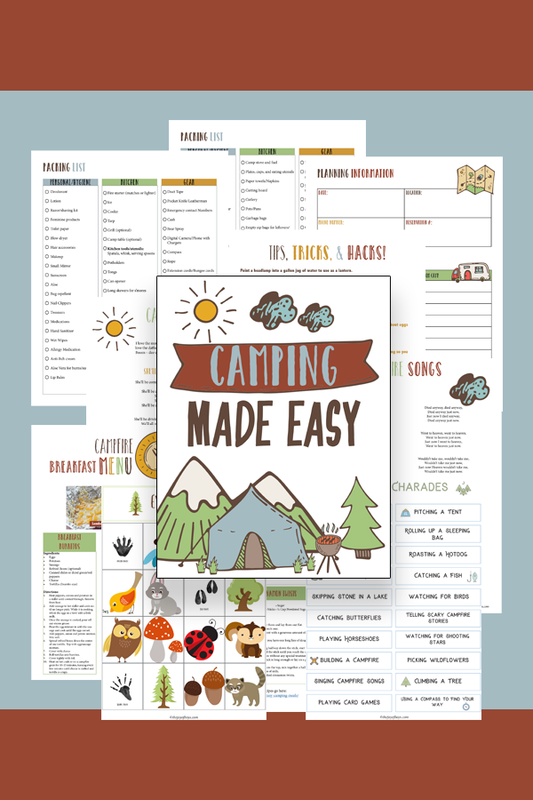 This printable camping pack WILL make camping with kids a breeze! Camping Packing Checklist – So you will never have to worry about forgetting something again! Camping Shopping Checklist – Know exactly what you need to grab at the store. This is divided into three sections: personal, gear and food, making shopping for your trip less stressful. Campsite planning and information – Where are you going? What will you do there? Keep it all organized with this campsite planning page. Camping Tips, Tricks and Hacks – There are a few simple things you can do to make camping easier. 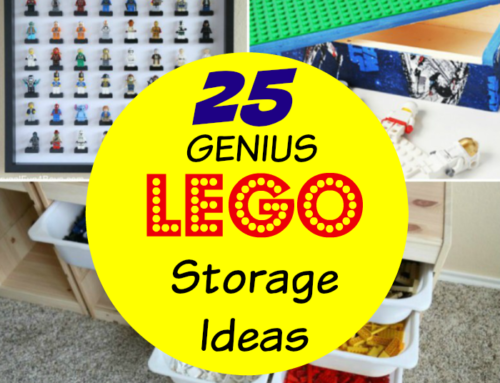 This page gives you some great ideas! Simple Camping Activities – This includes a Nature Scavenger Hunt your kids will LOVE and other simple camping activities. Camping crafts – With just a few supplies, your kids will enjoy making these simple camping crafts. Campfire Songs – These campfire songs are classics! 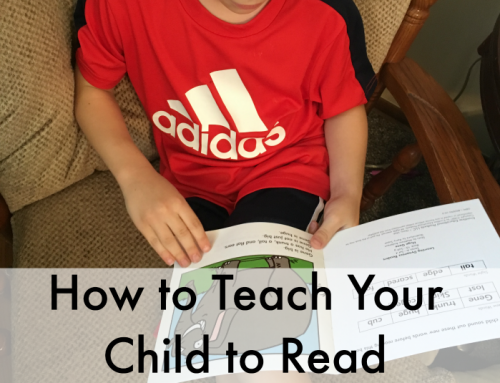 You’ll have so much fun teaching these to your kids. No-Prep Campfire Games – Enjoy your evenings around the fire with these no-prep campfire games that kids and adults can enjoy. 3-Day Camping Meal Plan – Three days worth of camping recipes with ideas for breakfast, lunch, dinner and of course dessert! These lists include the ingredients as well as step-by-step instructions on how to make them. 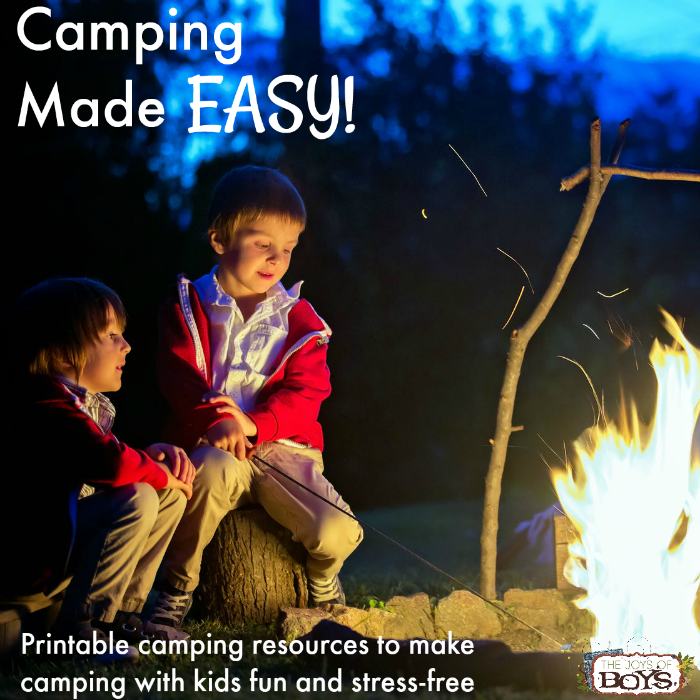 A total of 18 pages of resources designed to make camping easy and fun! That’s it! Then get packing and hit the road! And it’s ON SALE today! 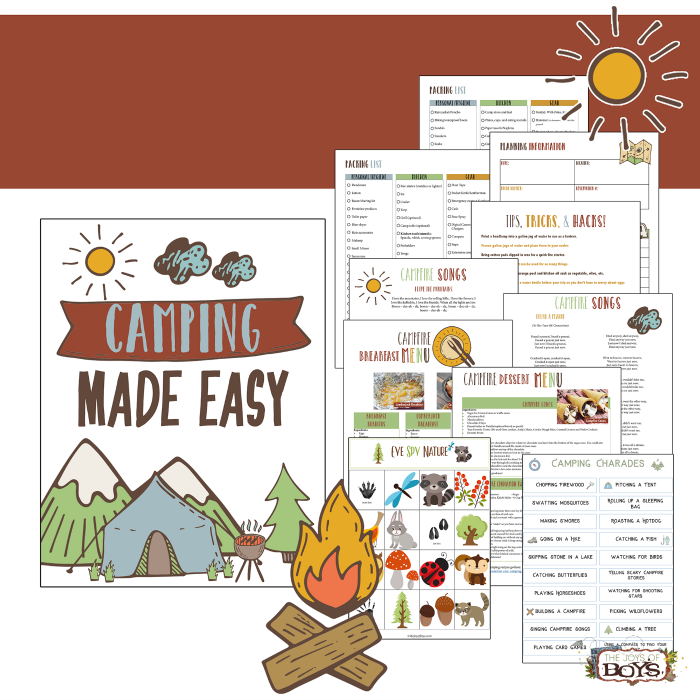 Get this Camping Made Easy Printable pack today and have a WONDERFUL time enjoying your next camping trip with your kids! YES! MAKE MY NEXT CAMPING TRIP STRESS-FREE!